Budget Blinds®, the largest window coverings franchise in North America with over 1,000 territories, recently participated in Designing Spaces’ Military Makeover special that surprised an injured Air Force veteran, his wife and five young children with a newly-renovated home better suited to the family’s ever-growing needs. 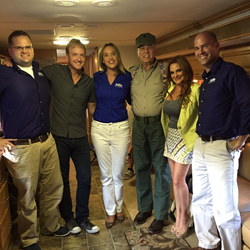 The show works hard to find deserving military veterans and families in need of home renovations in an effort to give back to those who have already given so much. They found one in Technical Sergeant Kevin Parke, in Crestview, Florida. An Explosive Ordnance Disposal technician, currently assigned to Eglin Air Force Base, TSGT Parke entered the Air Force in 2003. He served two deployments in Afghanistan where he survived three separate IED detonations. Despite sustaining injuries, he stayed with his team each time. For this bravery and his accomplishments, he earned countless medals and awards, including receiving two Purple Hearts for his injuries. The home's completed renovations were unveiled to the Parke family in a private ceremony on October 29, 2015. To see the family’s reactions to receiving the dream home they truly deserve, watch the three-part series of Military Makeover on Thursdays, February 18, March 3, and March 17 at 7:00 a.m. (ET/PT) on Lifetime® Television. For the renovation, Military Makeover teamed up with several valuable partners including Budget Blinds, who along with their valued manufacturing partner, Custom Brands Group, provided energy-efficient, child-safe window coverings throughout the Parke’s home. Budget Blinds offers Veteran programs that heavily discount franchise fees and recently received the Best for Vets: Franchise 2016 ranking by the Military Times. They have also received accolades or recognition for their Veteran programs from VetFran and Franchise Business Review™, as well as other prestigious franchise networks including Entrepreneur®, Franchise 500™, Inc. 5000, Canadian Franchise Association® and Franchise Times®. To learn more about their Veteran business ownership opportunities, visit budget-blinds-franchise.com. Budget Blinds’ segment is scheduled to air in the second episode of the three-part series on Thursday, March 3, and is scheduled to re-air on March 10 at 7:00 a.m. (ET/PT) on Lifetime® Television. Check your local listings.